If you know of a Mastiff specialty item that is really good - please tell us about it and post a link to the information here. We are always looking for great huge dog items and it would be so helpful to everyone to share information! Advertising welcome - not a problem.. we just want to know where to find it! Nice mastiff items with the picture of His Majesty's Margie on the mouse pad , coasters and a few other products. I emailed them and asked if they had anything brindle. Hopefully they will work on it. I wanted to give an up-date on what I found out about cool beds. He also has other products to help cool the dog in hot weather. See the belly wrap and scarves. You can buy the bigger sizes for home use. They are very heavy when wet..but that doesn't matter because you aren't trying to lift or carry them. an update: if you buy the belly cooler you will get extra velcro straps which add about two inches to the girth. Call before ordering to make sure it will fit your dog. Right now the shopping cart is not working, but you can call or email me for ordering. LOTS of great Christmas ideas here! Ornaments, Santas, Tree toppers, kitchen timers, paper towel holders, etc. Not sure if anyone has posted about this, but for anyone who hasn't heard about it, the SSMR (Southern States Mastiff rescue) is having an online auction Nov. 1st through the 6th. 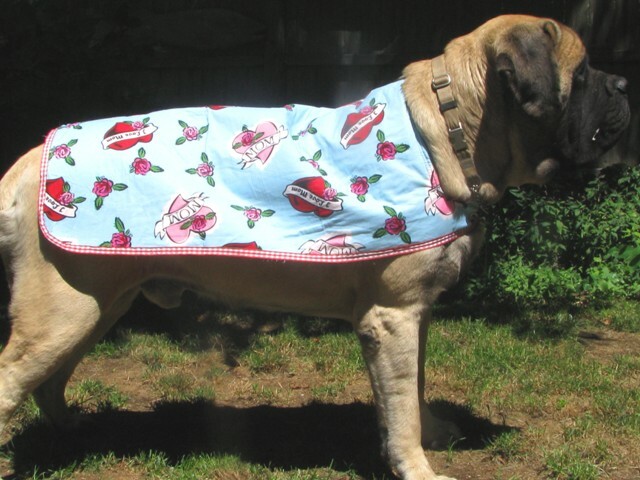 Dolly Moore is the webmaster and as the online auction coordinator, she's looking for vendors of quality Mastiff oriented products to become product sponsors for the auction. There are so many talented artists who post on the forum, and this is a wonderful opportunity to contribute to a worthwhile cause....for a minimum $150 donation, you get a listing on their "Shop Our Sponsors" page with a link to your product website, so it's also great advertisement for you. The link to the SSMR website is http://www.sosmastiffrescue.org. Contact Dolly Moore for details. Thanks! I went to the SSMR page http://www.sosmastiffrescue.org. and the landing page works fine, but couldn't get any farther than that, the next page had the little colored boxes (similar the the dreaded red x) and none of the links clicked for me? Was going to look at donating some jewelry items. Please email me privately and I'll send you the contact info for Dolly Moore, the online auction coordinator. I'm sure she'd love to hear from you! Yep Dolly did a great job on this! I will be bidding I NEED one of your stained glass artwork of my big guy General. Thanks so much. I'm happy to hear you'll be bidding, and I'd LOVE to do a stained glass design of General. He looks like quite the character. I'm hoping to bid on one of Louise's paintings. So many talented artists in our group! 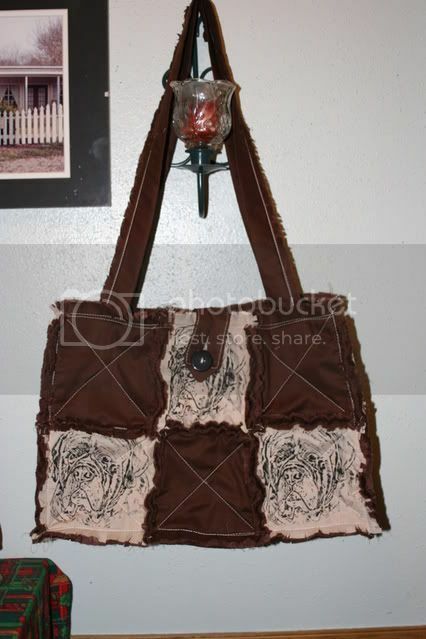 This is a customized bag that I have been making for the show ring to carry my things needed. I have altered a lot of things to make it "just right"
I do accept custom orders and have many other breeds available with about any color of background you would want. 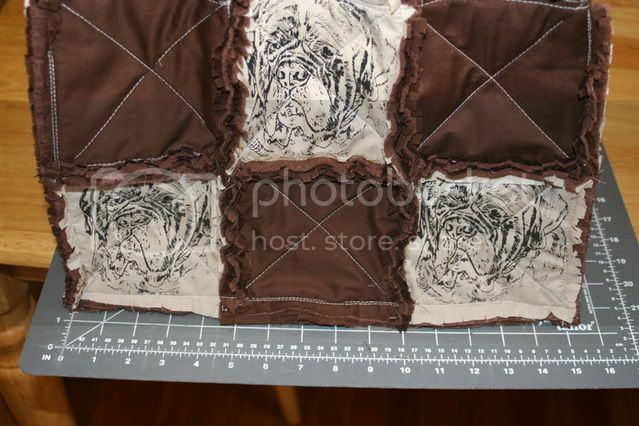 There are 2 different styles of mastiff heads available with different coordinating fabric. I will post more pictures soon. for those who have dogs that like to drink out of the toilet....AND boys or husbands who can't remember to put the lid down. You can buy a toilet lid now at places like Home Depot...that automatically closes itself after use It does work a bit slow but it gets the job done. Then the next time your dogs go for a drink, the lid will start to close slowly...I bet there isn't a mastiff born that won't be broken of that habit. Not to expensive either. p.s. I think it's also sold at Bed Bath and Beyond. I have toys and more will be added by the end of the week. All Mastiff people are jealous in Holland. 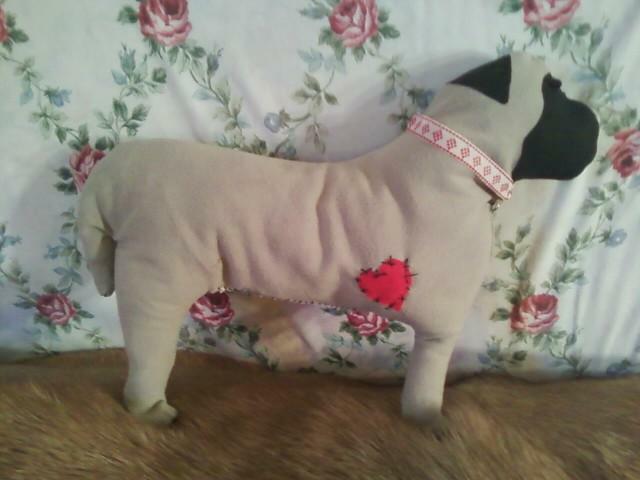 My website sells Big Dog Toys and Poker Sets for Mastiff Lovers! The original painting is of a fawn mastiff, Max, that one of my friends rescued. He has such a great face! The amazing thing about him is that he nearly died from bloat the day I took photos of him to do the painting... But he fully recovered from surgery and is a happy healthy 10 year old boy that still travels the country going to the horse shows with his mommy! 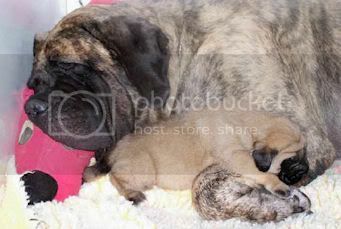 I also have a few bull mastiff prints and gifts on my site. There is a ball made by Earth Toys that my dog loves. I bought it at a small pet store...not a big chain store item. It's a soft rubber ball that has a picture of the world on it...that's how to recognize it. Be sure to keep a close eye on your dog with any toys! Sometimes, I take a RED APPLE and take an apple corer and remove the stem and seeds. Then I roll it on the ground outside. You MUST remove the black seeds first though. This is when I teach "Get It" and "Come"...She pounces on it and has fun with it and then gets to eat it afterwards. No more than one a day though. You could do the same with an Asian Pear..but remove the seeds and stem first. 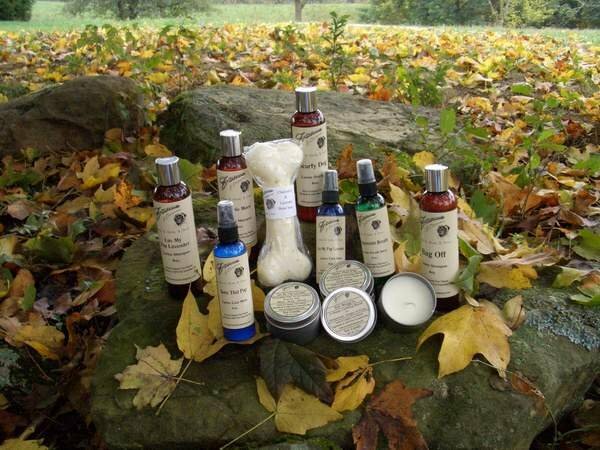 All natural, essential oil, herbal shampoo, coat mist and more! All product packaging features a beautiful mastiff head study! 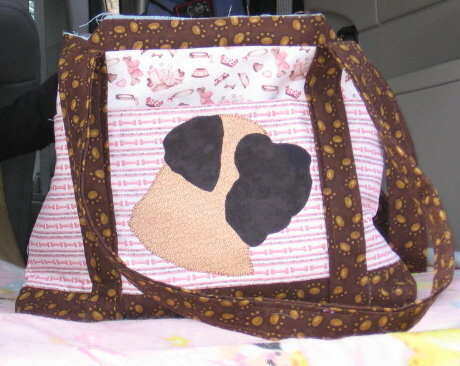 A portion of the proceeds go to help support mastiff rescue. To be nervous is to be cautious and how we survive. Thanks - good information to have for our big guys. 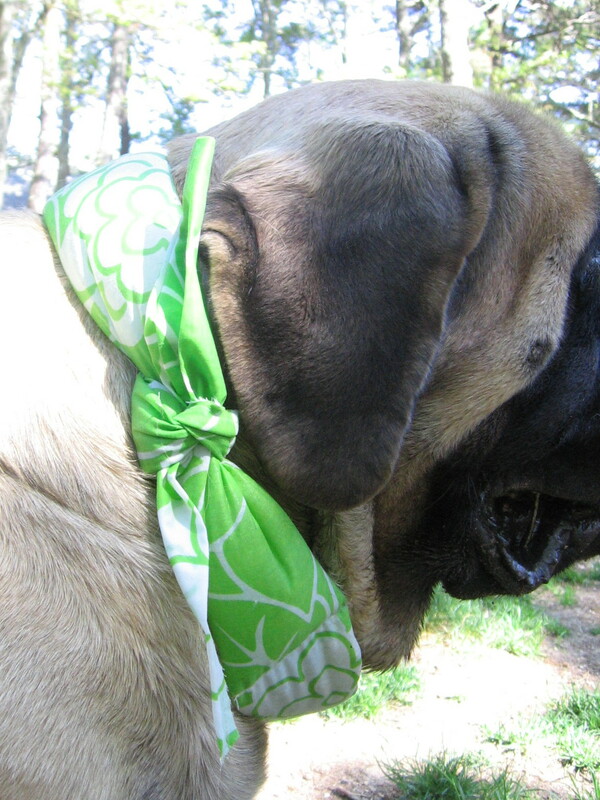 All sorts of products with mastiff designs on them: ties, shoes, shirts bumper stickers, mugs, cards etc. In all kinds of styles--there are some graphic modern illustrations, photo art, even a tattoo style design. 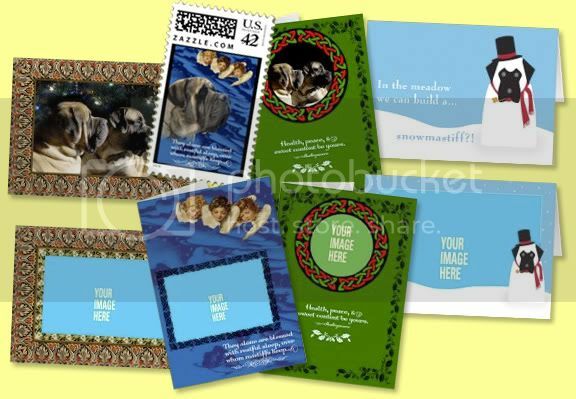 I made a few new designs for Holiday cards--mostly mastiff-specific--that have matching postage and a few other products (including some ties). The cards on my zazzle page can be customized with your greeting and sign-off. I also made a set of designs that are templates where you upload your picture and customize the greeting and sign-off. The cafepress page has cards and some things zazzle doesn't like outdoor banners and ornaments. Zazzle sent me a coupon code for holiday cards that I want to share with you-- 25% of orders of 10 or more holiday cards purchased by Nov 18th. The coupon code is HOLIDAYCARDS. Also free shipping on holiday postage purchased by Dec 31st. Coupon code-STMPHOLIDAYS. Just be sure to supervise while they are playing with the apple! Also, only use the RED apples. Apple seeds are bad for dogs so be sure to CORE them first. I have added a new section to my website called Big Necked Dogs. I am carrying collars for Really Big Necked Dogs. I have Lupine collars in 3/4" and 1" widths, adjustable from 18" to 41", with matching padded handle leads in 4 and 6 foot lengths. I will also have Flat-linked choke collars in size 26" to 36" in 2.5mm weight. (Nice and small but strong). I also have Nylon show collars in size 28" to 36" in Brown and Black. The site is still under construction but please check it out! Just as a heads up. I ordered and paid over 200 toward a stained glass from Kazia well over two years ago, and have never received the stained glass work.. I know that she has been ill, but she has promised to send the finished work twice over the last year, and still no stained glass. We have mastiff t-shirts short sleeve $12, long sleeve $20 and hoodies $30 in sizes Small to XXL. They are now available for sale on our website. Please check it out and email if you have any questions! It gets hot down here in Fla so my Tommy loves this Kool Dogz Ice Treat Maker. I put toys and treats and freeze it and it keeps him cool during those hot summer days! I saw this and right away knew it had to make the job of pickup easier and a lot more hygienic. Our trash service is going to be thankful, especially during the summer. I have yet to receive the adapter, but can't see why it wouldn't work great. I called the company and they were very informative. I was looking at one of those septic tank digesters, but our temps in Kansas would make the thing unusable for about four months. 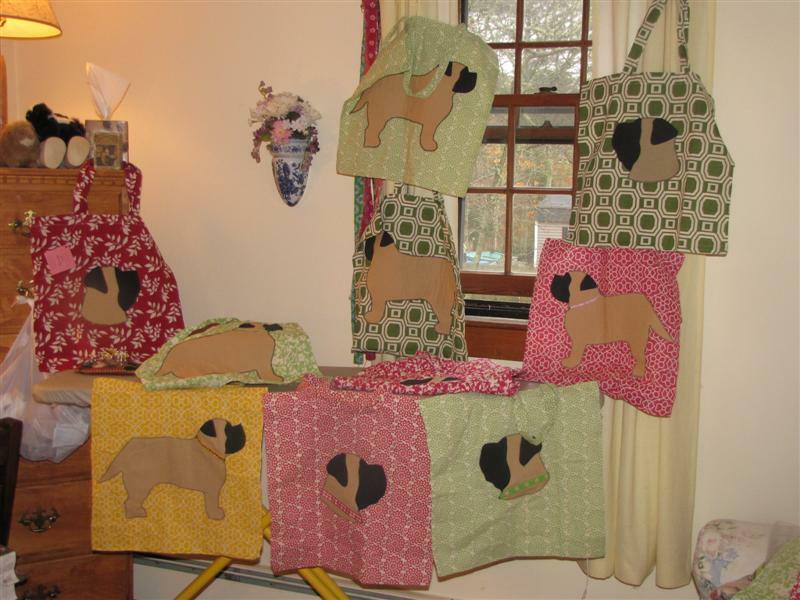 MASTIFF TOTE BAGS hand made by my friend Joan Paquette of Graycee's Goodees. Temporary website is a page on my website, go to Owenspride. com and click on Graycee's Goodees! 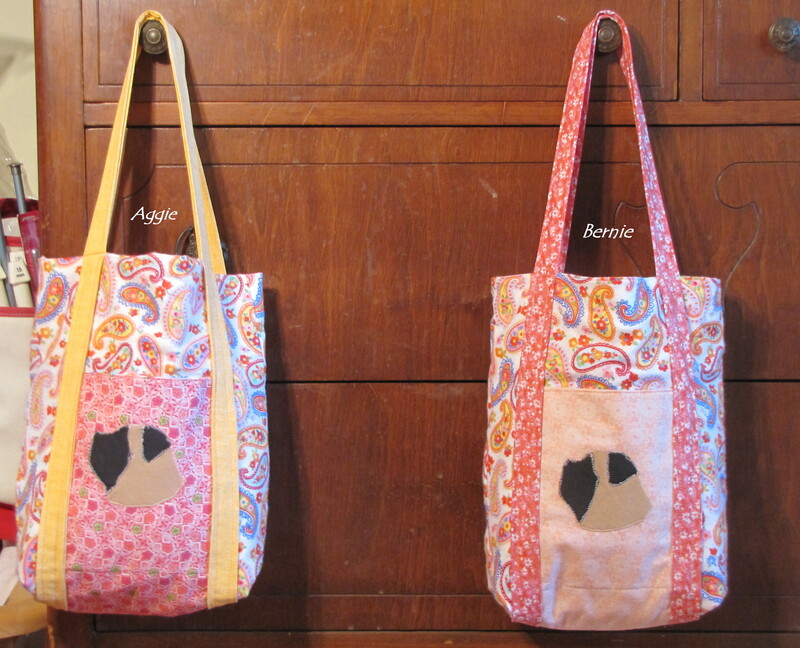 Six pockets outside, triple thick canvas totes with cotton print insides and outsides, black interiors with little white pawprints..soo cute and the straps are long enough to wear across your shoulder, hands free! Great for lugging crap to shows and looking cute at the same time. I may be bringing a few to Bucks, to sell for her. Or place an advance order and I can deliver to you at the show ? Her email address is rewopjmp@gmail.com. she ships quick and awesome handmade quality! no cheap fleece that pills! I took me a while to get my hands on those Quick-Release metal buckles..but here is my first collar made , using one of those buckles..this particular one is powder coated in black and it's 1in wide. Just a heads up, this time of year PIER 1 , online and in store, sells thier papason cushions for about 20 bucks. We use them for Dog beds. The two items I am recommending are the Big Dog Nylon Collars. They are super inexpensive at $9.99. And they are big enought to fit our wonderful dogs. Best Dog toy goes to, the Teaser Ball. This toy is the right size and the most durable dog toy I have found. 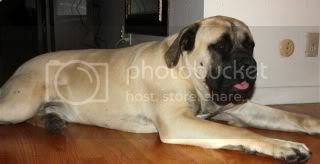 if you are looking for a giant crate for your Mastiff, I just ordered one from Dog.com. I paid $ 157.00 (tax and shipping included) for a 54”L x 37”W x 45”H wire crate. My baby will have lot of space in it and my furniture will be protected while I'm at work. misie love your avatar pict!!! I would like to invite all of you to go to my Bling Out Boutique on the Web. I have some great fashion Tunic tops that never wrinkle. They are great for travel, Dog Shows, and cover Faults--Yours not the Dog I also have New Big Paw Jewelry to wear or to buy as a Trophy Gift from your Kennel. Also Bling Dog Collars. I have a Business Facebook you are welcomed to look or join --it is ONLY about Fashion. We have contests for you to win Free Products if you are a member. Each weekend we have an Introductory SALE on a New Item every Weekend, so always check on weekends for sure. Oh Thank You, that is very sweet of you to say. Since it is harder to get up our new Spring Fashion on the Web (and not my job ) Please look or join the Bling Out Boutique Facebook--We sell there new items or 1 of a kind items, and all of our new Spring line there first. We also do contests about every 2 weeks and give aways and ship FREE if you win. You do not have to join to view, but do have to join to be in contests. http://www.owenspride.com; then "m.c. 's sew cute" tab. Really NICE large dog beds.. Your large breed specialist, we offer large dog beds that support over 200lbs. Take a look at our memory foam options for older dogs that need orthopedic support. Superior quality since 1995 at wholesale prices. 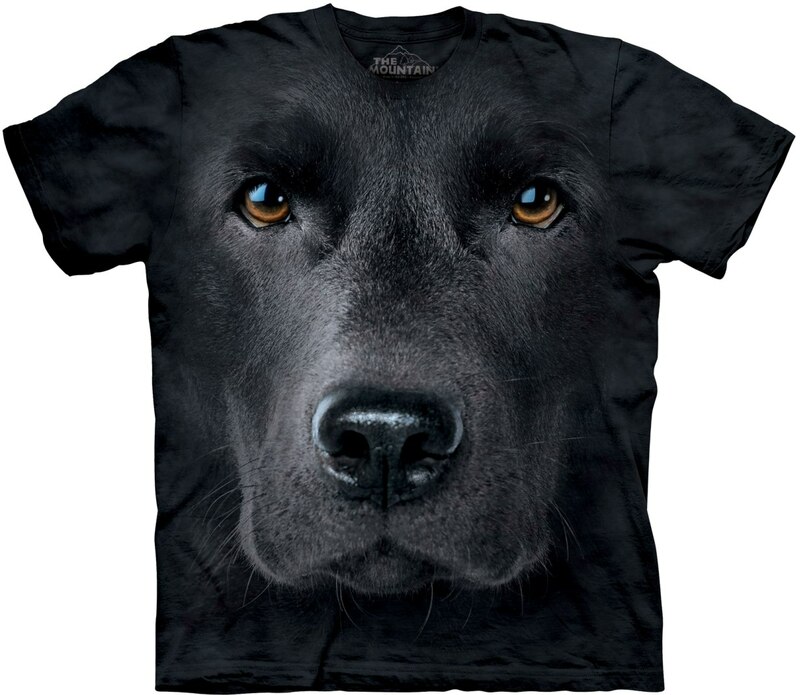 Mastiff Face T-shirts (and other breeds too). So detailed it's almost like you can reach out and touch their wet nose's. 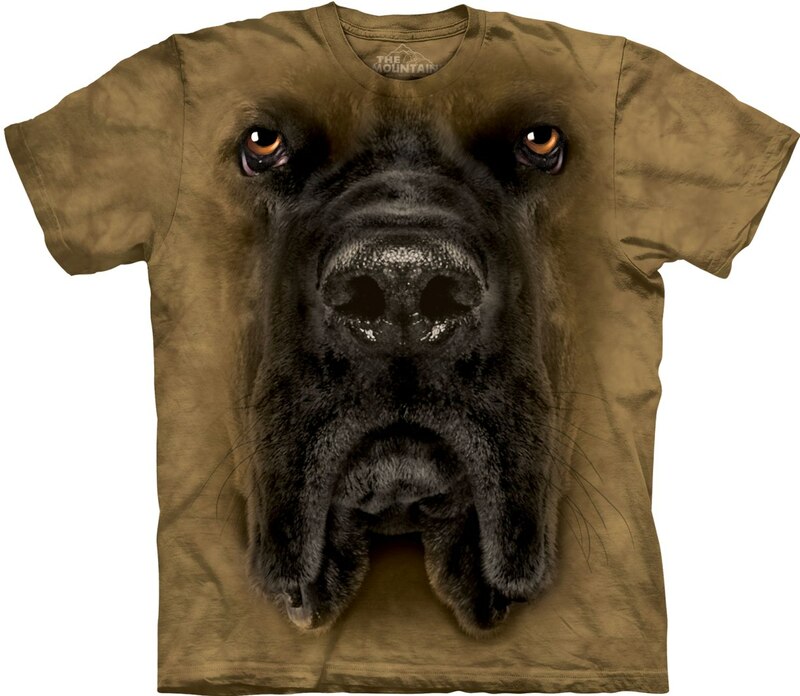 New website for the above posted mastiff face t-shirts link. Now with even More selections of tees to chose from!!! FYI ^ This is NOT the EBAY seller that has been complained about on this forum! 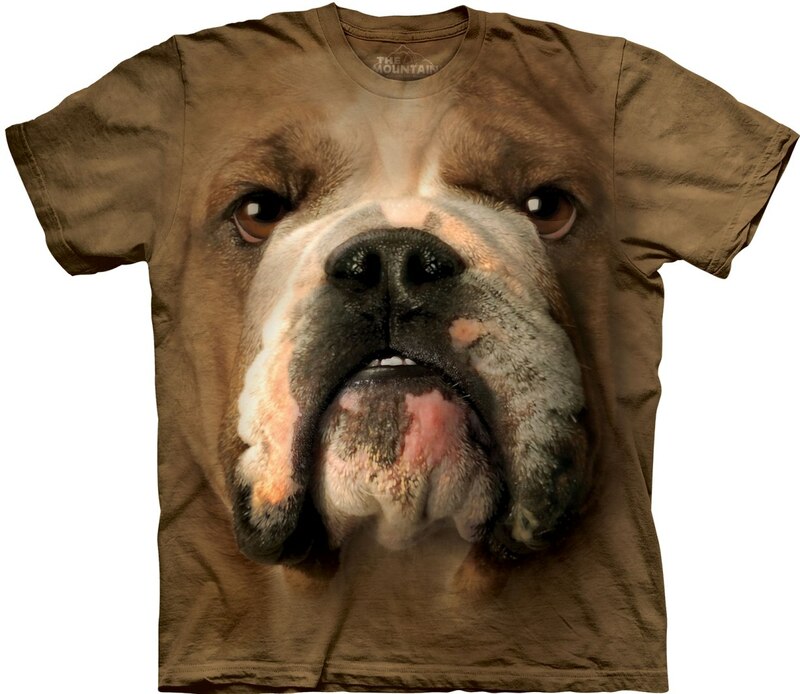 Dog Face T-shirts is now featuring Zarus & Company™ All Natural Spa Products! Online store now open! With herbal shampoos such as Bug Off & Luv My Pup Lavender. Canine coat mists such as Tail Wagg'in and Tame That Pup. All natural and 100% pure essential oils. Be sure to check out our specials page as they wont last long!